Every product manager knows that roadmapping is an essential aspect of the planning process. Without a product roadmap, it can be difficult to express your vision you have of your product to your team. Roadmap planning allows you and your team to categorize requirements, keep track of estimates and predict where your product is going. Roadmaps should periodically be referred to during the development process. Agile processes are put in place to make the product development move along faster. As more and more companies turn to Agile processes, roadmap planning becomes more essential as well as more challenging. Good product roadmaps start with proper requirements planning. It helps to have a system where you can identify high level requirements and later on, break them down into different levels. In an Agile environment, requirements change frequently. Therefore, you and your team need to develop a system in which requirements can easily be moved and re-prioritized. Whether you use a board and sticky notes or a requirements management software, the most important thing is to have a set system that everyone is aware of. More importantly, teams must be able to estimate and prioritize requirements based on real-world data. Scoring requirements and establishing dependencies around them make them more viable on a product roadmap. Even though Agile is adopted to help speed the development process, it does not mean that every single project, especially if there is an excessive amount, will be completed on time. Agile roadmaps can give a better idea of where projects are headed and when they will be completed, however, the only way teams will get through the projects smoothly is if they know which projects they should prioritize, and which ones have unrealistic deadlines. Teams that are used to traditional planning usually make two wrong assumptions: That a roadmap’s function is to develop a project estimate, and that budget planning means setting a fixed budget is required before starting on the project. Agile planners understand that roadmaps serve to draw a big picture of where projects are going, and what their estimates are. Experienced Agilists know that predicting your estimates too far in advance should be avoided because changing realities will affect everything including estimates. They also know not to let general roadmap predictions become cost and schedule estimations, a habit that traditional planners often get into. Ensure that the entire team understand that a roadmap is simply a roadmap and not a workplan. Roadmaps are made to aid with strategic planning and give everyone a sense of where projects are headed. When built properly, good roadmaps can help teams convince the enterprise that each program is beneficial, and will improve the business. 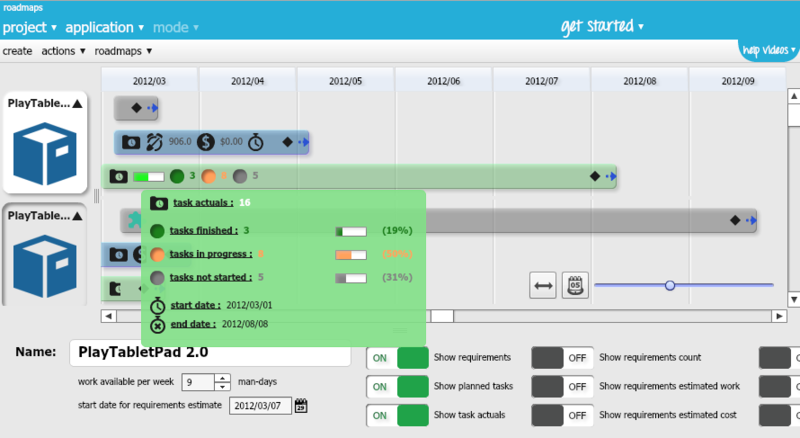 OneDesk’s roadmapping application was designed with an Agile mindset. Integrated with all of our project management applications, all changes made to requirements, tasks or issues are automatically reflected in the roadmap. It allows you to visually lay out cost plans and schedules by and provides more accurate analyses and estimates. Learn more about our product roadmapping application.